Working as a fisherman was hard work, the fishing season in the kingdom of Castle Keep was short but intense. 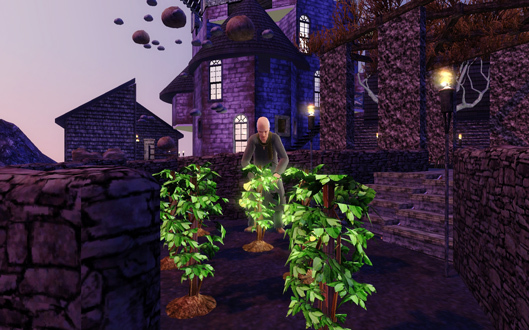 When he was younger, William Fisher would travel to other shores to fish when the fishing season in Castle Keep reached its end. However, that meant being away from home for months on end. Anne Fisher, who had come to Castle Keep from faraway lands to marry William, set an ultimatum, if they were going to make a family she would not accept William to be away. Really, he didn’t have much choice, he loved Anne, stubborn as she was, so he got a job at Shakespeare’s Globe in the music career. Anne, who came from a long line of healers, joined the medicine career at Aesculapiu’s Health Center as soon as she was settled in her new home. The other healers at the center were a bit skeptical of her methods and cures, since they differed from what they found familiar and known. However, she soon showed them that her cures were superior to some that had been used in Castle Keep for ages. While this impressed many of the senior healers, it also made her some enemies that disapproved of her unconventional ways. 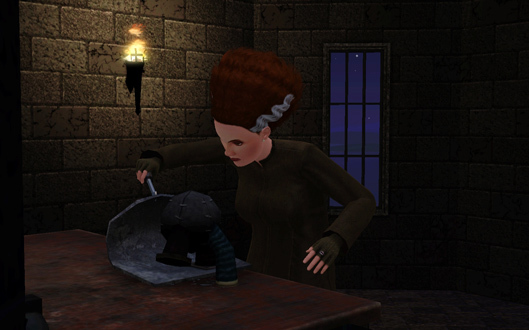 It wasn’t only the healers that had reservations about Anne Fisher, she was an unusual young sim, in many ways. In the Kingdom of Camerina, where she was born, all the subjects were taught in the ancient martial arts of Sim Fu, and Anne often practiced it at the Garrison Training Facility. 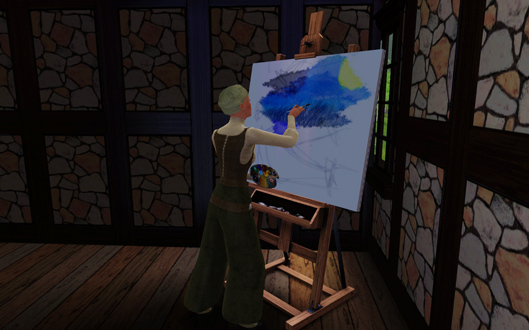 Of course, while some condemned it, other sims became curious and interested in learning it. 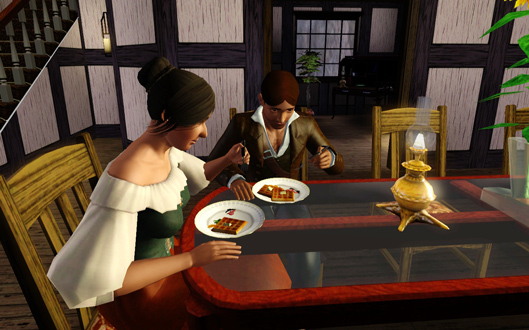 Despite the fact that sims of Castle Keep saw Anne as a bit of an oddity, William and Anne had married due to their strong love for each other. Anne was here to stay, even though she missed her home kingdom at times. 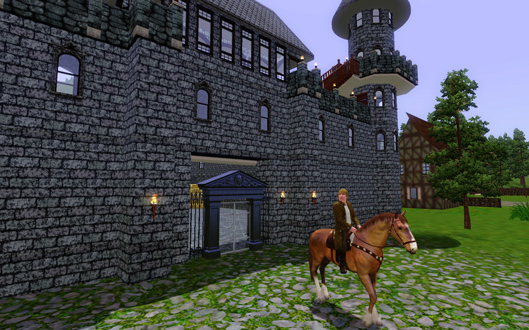 And whether the sims of Castle Keep approved of her or not. For William, if being with Anne meant that he would not be able to fish all year around, it was a small price to pay for the love she gave him. Specially in light of everything she had given up for him. Unlucky as Mary and Mark Le Peasant were, it hadn’t been long since they were married, when Mark was drafted to go out to fight for his lord’s army. Mary was left alone to take care of the fields and the household in their small cottage, uncertain of when she would see her young husband again. Now, finally together, they welcomed the return of peace to the kingdom. Mark was still a soldier in lord d’Angerville’s army, but with the times of peace there was a small risk he would be called away from home and risk his life on the battlefield. To be outdoors, working the lands together with his beautiful Mary, was all he could ask for. 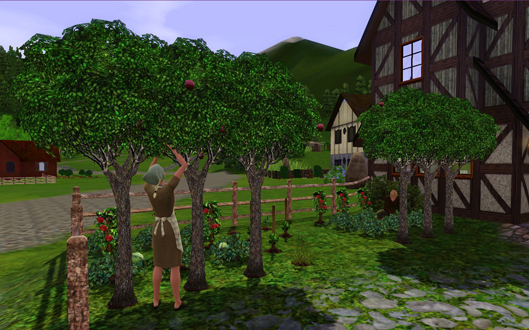 When Mary Le Peasant wasn’t working the fields, she served food at the Crossroads Pub, to make ends meet. She was a good cook and server, people appreciate her hard labor. Sure, the clientèle wasn’t always the most descent crowd, but the income was well needed for the family. Although they have been married for some years, Mary’s and Mark’s marriage was never consummated before Mark was called off to war. Of course, they kept it a secret, or they would’ve risked the marriage being annulled. She never told him, but during the years he was gone, sometimes she doubted he would come back and was afraid of what the future held for her. With Mark’s return she felt a new sense of security, maybe now was the time to build that big family they always dreamed of. Life had already been harsh on the young lovers and there was little promise of a better future. The life of a peasant in Castle Keep was one of hard work and humble living. Although born unlucky, they could not help but hope for The Watcher to take pity on them and bring them a brighter future for them and their children. When Elmer and Lecie Wall got married, they did not only commit themselves to each other in the eyes of The Watcher, but also in the eyes of each other. True companions in life, they took on what life had in hand for them as a true team. Being the only daughter, Lecie had inherited the big house they now lived in, on 224 Abbeyhill Road. Still, life as a merchant wasn’t always easy, specially taking in mind that Lecie and Elmer were not the conventional type. The house wasn’t big, but they had a small space to keep Bonnie, the family mare. Lecie loved the mare as her own child, taking care of her and making sure she was well trained and brushed. The Walls were sure Bonnie would bring a great income to the household if they kept her in shape. As a merchant, Elmer was excluded from joining the law enforcement career, something he had dreamed of since he was a child. 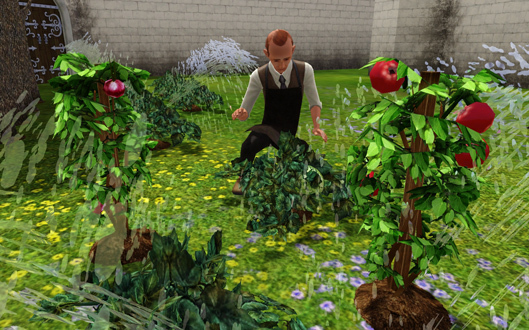 However, he soon realized that nothing could stop him from becoming a private investigator and help the sims of Castle Keep, were the law had failed. At the South Watch Tower, he would get his cases from a friend in the law enforcement career and go to the victims themselves to help them. Lecie was a virtuoso and loved playing every instrument, when she married Elmer, she had to give up her music career. The law of Castle Keep didn’t allow married women to have jobs. 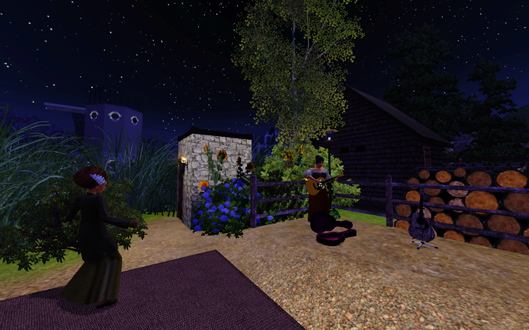 However, she would play for tips at The Poor Man’s Dance Square in the evenings, and she was greatly appreciated for her talent. Elmer had to get up fairly early in the mornings to take care of his cases, while Lecie would come to bed very late at night after her performances at the local dance square. 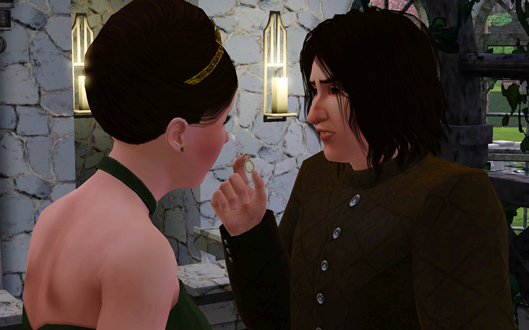 This put some strain in the marriage, but they were both big believers in following their dreams and were willing to pay the price, no matter what sims around town would say. At the Merchants Guild & Scribe, Osmond Potter worked long hours to provide for his family. The Potters sold goods from faraway kingdoms during the 50 years war, but with the peace resolution they had to adjust their business. Osmond not only now worked in the journalism career, he had started to export local goods to foreign kingdoms, apart from his usual import business. Things were going well, albeit a bit slow, but the future looked prosperous for the family. At the Potter residence, Winifred worked with creating goods to export, she was an excellent painter and sculptor, and amongst other things she made replicas of the works of the masters of pagan time. These works were very sought after both in the Kingdom of Castle Keep and in foreign lands. Winifred and Osmond were a passionated couple, both young and handsome, everybody expected them to marry each other and have plenty of children. However, Osmond was not the most eloquent charmer and Winifred was known for her temper. Still, it shouldn’t take long for them to conceive a child. As a means of gaining a larger income, Osmond decided to breed the Potter mare, Victoria, that he had gotten in his inheritance from his father. If things went well, they would sell horses and maybe keep one to train for some award winning competitions. It didn’t take long for Winifred to realize she must be pregnant once she started to wake up early in the mornings feeling nauseous, having to run to the toilet to relieve herself. When Osmond found out, he was delighted, their love child was growing in her womb and if they had a son, he would surely bring them not only happiness, but also fortune. 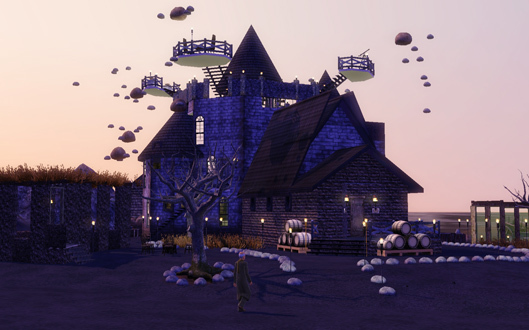 At The Dark Castle, the changes that came with the peace resolution between the Kingdom of Castle Keep and the Kingdom of Othirer, were also very much felt. What mattered the most to the Vaughans was the pursuit of knowledge and even though they didn’t care either way about the actual war, it had meant great riches and freedom for them. The Royal family had greatly invested in their projects and they had earned a lot of simoleons with their inventions and scientific advances. The end of the war meant that they had to find other ways to pay for their projects. For Thea de Servant, who had been in a very secure position compared to her brothers that served at The Royal Castle and The White Castle during the years of war, the peace resolution meant an insecurity that she had never experienced before. Yet, she tried to make herself unnoticeable and went about the business of the household chores as quiet as possible, hoping that she wouldn’t be let go. 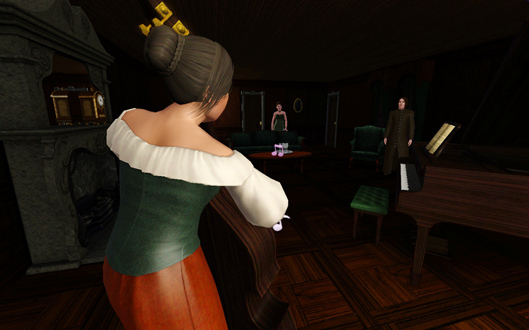 Lady Vaughan, who had been given free reign to invent and experiment as she had liked, at the castle workshop, felt her position threatened with the times of peace. Before the 50 years war women of the noble houses were not allowed to either join a career or be self-employed, but due to the war and the lack of work force, they had been granted the right to self-employment. Lady Vaughan had built herself a workshop at The Dark Castle and started inventing, she had reached great success with her inventions, many of them had given the Kingdom of Castle Keep far advances during the war. For the lord of The Dark Castle, the peace resolution didn’t mean too big a threat for his occupational position, he lead the work at the observatory of Castle Keep, and their work would continue with or without the war. However, the King would hardly support their research economically, unless there was a direct interest for the Royal family. Lord Vaughan was still a close adviser of the King, and was not without influence in political decisions. It was also in his interest that Lady Vaughan continued her work, her inventions had been of great use at the observatory. With more time on their hands, Lord and Lady Vaughan found themselves with more leisure and time for pleasure. They had longed for a child for some time now, but were reluctant to bring one to the world of war, so they had restrained their urges in favor of their pursuit for knowledge. The time was right now, after all, they needed someone to leave their empire of knowledge to. The former days of glory were over for the d’Angerville family now that the 50 years war was at end. Not a week had passed since Lord d’Angerville had been appointed as the High Constable, by the King himself, when the 50 years war ended. Lord d’Angerville, who came from a long line of great military leaders, was not too disappointed, he could now enjoy all the benefits of his rank without having to risk his life at war. Among his obligations were the duty to train the Kings army, protect the Royal family and the kingdom in general. He was the main military advisor of the King and as such, had great influence over political decisions that were made. All the honor and power of his position, however, did not translate into great material value, just yet. The great halls of The White Castle had seen better days. All decorations and valuables had been stripped from it to be sold, melted or used during the 50 years war. The d’Angerville family was in a dire economical position, the worst they had seen for generations. They still earned an annual fee from their lands but something more had to be done for them to regain their glamorous life. Lady d’Angerville, that came from a long line of fertile women, was of the opinion that to bring back the glorious days of the d’Angerville family, the most profitable long-term investment laid in the bedroom. First and foremost, a son had to be conceived to ensure the continued line of the family. Secondly, a daughter married to the crown prince meant even more power. Without stretching it too far, if they had a third child that would become head of the Peteran Monastery, the next generation of d’Angervilles would sustain all the positions of great power in Castle Keep. It was a plan that could not fail. The dream of a luxurious and comfortable life need not wait until the next generation of d’Angervilles, there were measures to be taken on the short-term. 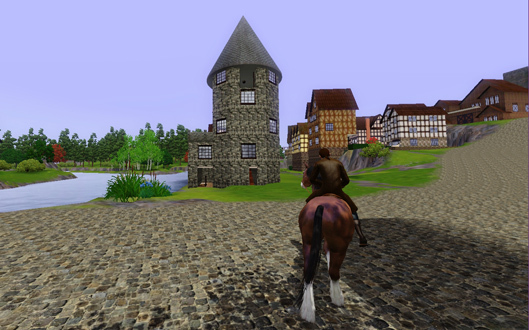 The kingdom was in need of goods and the crops from the d’Angerville lands and their horses were sold swiftly. At the same time it was of essence to cut expenses, Lady d’Angerville decided she would no longer go to the Peteran Monastery to buy nectars, which was one of the noble class’ most valuable goods, she had a dream of a bottomless nectar cellar, and decided to make her own. Behind every great nectar there is a great garden, and Thomas de Servant found himself with an increased work-load now that his lady had decided to make her own nectar. However, it was in his interest to see his lord and lady gain economical power, or his own position would be in jeopardy. Life at the Peteran Monastery had never been so quiet and secluded as now, after the end of the 50 years war. Peter the Diligent was concerned about the future of the monastery. He was the only priest left from the hundreds of monks and nuns that had once passed through these quarters, it was up to him to restore the grandeur of the Peteran Monastery. The royal wedding between King Edmund I and Queen Eleanor I, had been a good event to reestablish the authority of the Peteran faith, and the Queen and King supported the monastery and the Peteran faith. Still there was much to be done. 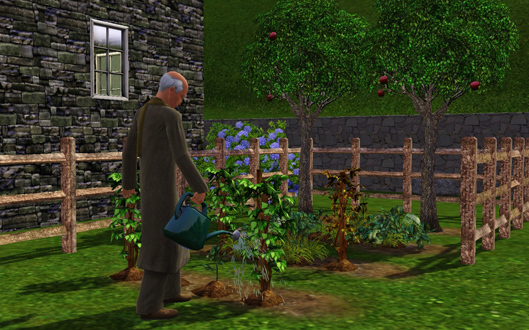 Still, Peter the Diligent, enjoyed the quiet loneliness of the monastery, he would rise before the sun to meditate, then pray and after his morning meal he would tend to the garden, that needed constant care. He was determined to maintain the work that nuns and monks of the Peteran faith had sustained through generations. Rare plants that had disappeared from the fields of the kingdom due to the expanded agriculture needed to be saved from extinction, it was only in the monastery that these seeds could still be found. Plants that were used for ancient remedies and for the making of traditional nectar produced right here at the monastery. The days would pass swiftly at the monastery, hard work kept Peter the Diligent concentrated throughout the day, but if he was to save the monastery from dying with him, he had to get out and meet the people of Castle Keep. It wasn’t enough to hold the weekly sermon, he had to get out and show them that the monastery was an option for their children and that the Peteran faith was important to follow. The Watcher was everywhere and was measuring the devotion of the devotees. Peter the Diligent had heard that the library at the Circle of Magic was getting a lot of visitors and decided he had to go and find out what it was all about. Maybe the von Oz wizards that kept the library could work together with Peter to recruit members for the monastery. 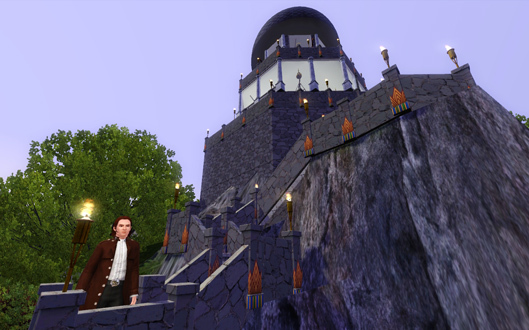 For many generations, the Peteran Monastery was the only place where sims could learn to read and write, which had brought many to the monastery, but if the Circle of Magic was competing with the monastery, it could mean trouble. The von Oz wizards, Bianca and Bruno, were happy to welcome Peter the Diligent to their library, they agreed to cooperate as long as Peter would promise never to condemn their library in his sermons. They also agreed to exchange seeds and plants to maintain the traditional plants of Castle Keep and not let the wisdom of the past be lost. Peter the Diligent was happy with the meeting, but was not sure how they would go about to recruit nuns and monks to the monastery. An opportunity would surely come up soon, he thought, The Watcher might help him. The day had arrived when the King of Castle Keep, Edmund I, was to marry his betrothed, Eleanor of Othirer. The wedding took place the day after Eleanor had arrived in Castle Keep. Everybody gathered in the Castle Keep Peteran Cathedral to attend the wedding, that was the greatest event taking place in Castle Keep since the declaration of peace of the 50 years war. King Edmund I was more handsome than ever, and Queen Eleanor I, who albeit a bit clumsy and ungracious, was a true beauty. Everybody held their breath when they exchanged vows and rings in front of the Peteran Priest, Peter the Diligent. 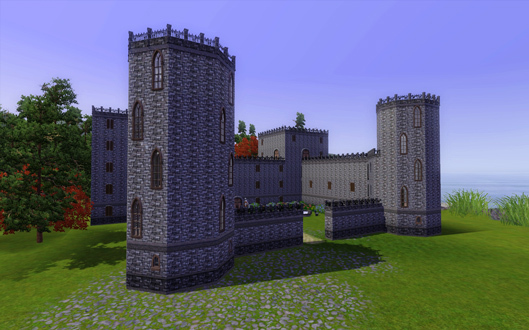 The ceremony was the starting point of a new era in Castle Keep and everybody rejoiced in the happiness of the kingdom. With a Queen, the future of Castle Keep was surely secured. After the formal wedding at the Peteran Cathedral, the King and Queen held a grand celebration at the castle. 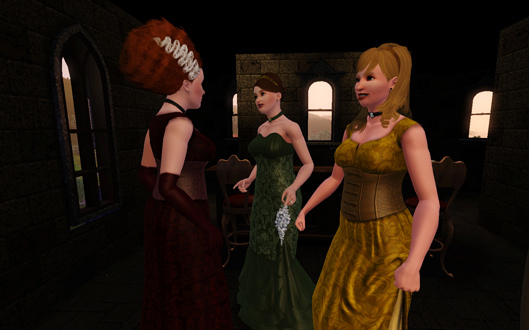 All the important sims of Castle Keep attended the festivities, members of both the noble houses and other influential sims of the town. It seemed like Eleanor I and Edmund I had really taken to each others liking, hopefully it would be a successful union promising offspring and years of stability. Local musicians and entertainers performed during the celebration and all the best foods and drinks were served by the royal household. The guests were quite impressed with the extravagant and lavish meals that were served, there had not been a festivity the like since, well, since before the 50 years war. It was of outermost importance that everything was done to perfection, and the head of the royal household, John de Servant, didn’t rest for a second until everybody was satisfied. One thing that Queen Eleanor I and King Edmund I had in common, was that both were very fond of celebrations and festivities. Several of the members of the nobility also enjoyed a good night of entertainment, so the festivities continued until the young hours of the following day. When all the guests had finally left the royal castle, Edmund I and Eleanor I had finally a private moment. The most important deed of the wedding celebration was to take place behind closed doors, but reports would be requested by all the influential residents of Castle Keep. An unconsummated royal marriage could be annulled under the laws of the kingdom. Everybody prayed for an heir.